The search for the origin of life often leads deep into Earth’s geological record. 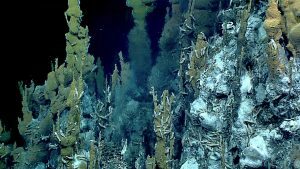 Based on fossil evidence, scientists believe that early life may have thrived in a hydrothermal seafloor environment 3.8 billion years ago; however, because of Earth’s active plate tectonics, most geologic evidence from this time period has been altered or overwritten by more recent geological activity. To circumvent this problem, some researchers are exploring another distant location: Mars. A group of researchers led by Joseph R. Michalski from the University of Hong Kong recently uncovered strong mineral evidence of contemporaneous hydrothermal activity on Mars. Since Mars and Earth share a similar early history, these deposits could potentially lend insight into the conditions on early Earth. Their research was published in July 2017 in Nature’s Communications. Earth and Mars both formed about 4.6 billion years ago, at the same time as the rest of the Solar System. Theoretical models combined with chemical and geological evidence suggest that their early environments were very similar; thus, their early geological records are thought to hold analogous information. Furthermore, whereas Earth’s early geological record has been mostly deformed or destroyed, Mars’ remains largely pristine because Mars, unlike Earth, no longer has active plate tectonics. Earth’s interior is divided into three main layers: the crust, the mantle, and the core. The crust is the Earth’s surface, the core is the Earth’s center, and the mantle is the thick layer of molten rock in between. The theory of plate tectonics posits that Earth’s crust is divided into several sections, or plates, that push and rub against each other to produce mountains, volcanoes, earthquakes, and other geological phenomena. These movements are driven by convection within the mantle, a process of heat transfer that results in the creation of a sort of cycling current. This process is analogous to a pot of water on a stove: the burner directly heats the water at the bottom of the pot, causing it to rise. When this water reaches the top, it loses some of its heat to the air, causing it to cool and sink back to the bottom, where it is heated again. This repeated process of heating, rising, cooling, and then sinking creates a sort of current inside the pot. The Earth’s mantle undergoes a similar process, except instead of by a stove, it is heated by the Earth’s core. One consequence of plate tectonics is the constant recycling of oceanic crust. When two plates push against each other, one of them is sometimes pushed beneath the other, causing it to sink and melt in the mantle. This process, called subduction, is particularly prevalent in oceanic crust. As a result, ancient oceanic crust is often destroyed or altered over time, meaning that clear geological records documenting the emergence and early development of life are difficult to find on Earth. Geological evidence suggests that Mars may have once also had plate tectonics; however, due to its relatively small size, they stopped long ago. All planets radiate heat, meaning that they slowly cool over time. Since Mars is much smaller in size than Earth, it loses heat at a faster rate, similar to how a cup of tea would cool faster than a pot of soup. Since plate tectonics depends on convection, which in turn depends on the presence of a heat source, this heat loss means that Mars’ plate tectonics eventually shut down. Thus, Mars’ ancient geological record remains relatively undisturbed, making it a valuable “Rosetta Stone” for studying the environmental conditions on early Earth. The Eridania basin is one of the oldest regions of Mars’ crust. Previous research has shown that it is composed of several smaller, connected sub-basins that were once filled with water to a depth of up to 1.5 km, making it the site of an ancient sea. The Eridania basin once contained more water than all other Martian lakes combined, and it would have had almost three times the volume of the largest lake on Earth, the Caspian Sea. Michalski’s group expanded upon our knowledge on the Eridania basin by analyzing its mineralogy using data collected via high-resolution satellite imaging and infrared spectroscopy. Infrared spectroscopy uses infrared light, a type of light invisible to the human eye, to “look” at chemical compounds and identify them. 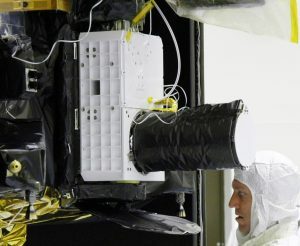 The infrared data used in the study was collected through NASA’s CRISM (Compact Reconnaissance Imaging Spectrometer for Mars), an instrument on the Mars Reconnaissance Orbiter that searches for mineralogical evidence of past water on Mars’ surface. Satellite images were used to help the researchers contextualize their results in terms of the planet’s actual geography to create a better interpretation. The researchers discovered that the Eridania basin contained iron- and magnesium-rich clays. These substances are widespread across Mars’ surface; however, the specific types and distribution of clays present was unusual and sometimes matched better with terrain on Earth’s seafloors than terrain on Mars. For example, they determined that the clays were crystalline in structure, as is typical for a terrestrial seafloor environment. In addition to clays, the researchers also found evidence of carbonates, silica, and sulfides, compounds all formed through hydrothermal activity, or underwater volcanism, on Earth. Using a crater counting function, the researchers also determined that the deposits were about 3.8 billion years old, contemporaneous with the oldest evidence of life on Earth. Eridania’s clays may have formed through evaporation. However, this would have resulted in the production of chemical compounds not present in the deposits, making this hypothesis unlikely. An alternative explanation for the deposits is air fall—for instance, wind could have carried ashes from a nearby volcanic eruption into the basin. However, since no deposits of similar age were found anywhere outside of the basin, this too is implausible. Thus, the researchers concluded that the deposits were most likely created in a hydrothermal context. This is supported by the presence of large volumes of lava on the basin floor, indicating that significant volcanic activity occurred at some point during the basin’s history. The Eridania basin is unique among other sites on Mars in its ability to illuminate the conditions surrounding the origin of life on Earth. Not only does it represent an ancient hydrothermal environment, but it was also active around the same time early life thrived on Earth. Michalski hopes that future studies will continue investigating the details of his group’s current results. He also hopes for a rover visit to the Eridania basin in the future. “If we can visit it with a rover and obtain some physical samples of the terrain, we would surely learn a lot about how life originates, even if we don’t find direct evidence of life,” Michalski said.